It has been a busy weekend, didn't have time to post or visit other blogs. 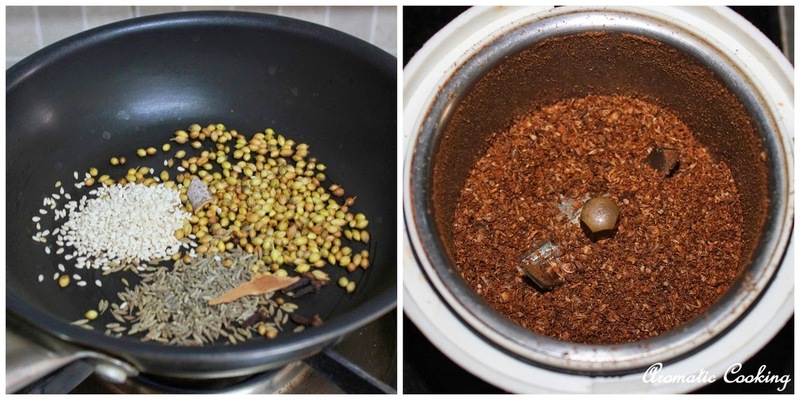 Today also, I am posting very late, well, coming to the dish, Vellarikka Masala Bhath, I had noted the recipe long time back, did it a couple of times, then I thought, I lost the paper that I had noted it down. After so many years, recently, while checking some old notebooks, I came across this piece of paper. 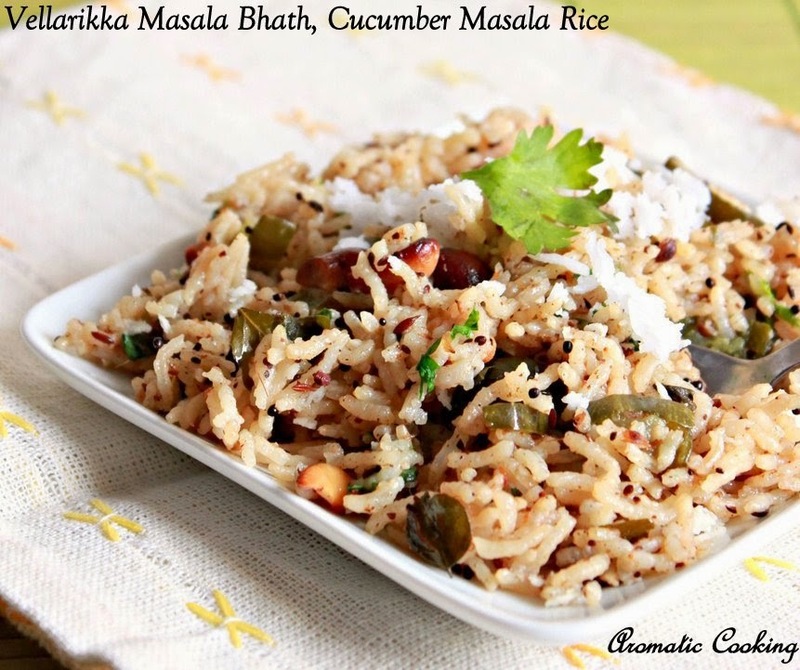 This is a very simple recipe, but the rice is so flavorful from the masala and the cucumber, it's not very spicy and it goes very well with tomato raitha or even with some plain curd/ yoghurt..
Roast all the ingredients given under ' to powder' and make a powder and keep. Wash and soak the rice for 20 to 30 minutes. Heat some oil in a pressure pan, add the cashews, followed by the cumin and mustard seeds. 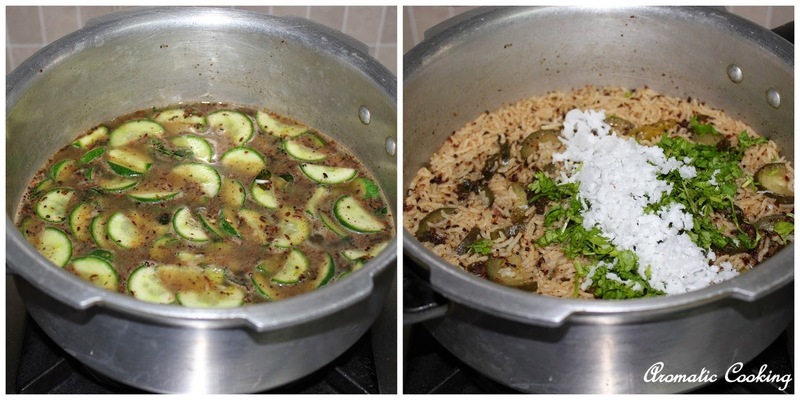 When it starts spluttering, add the green chilly and curry leaves, mix it, then add the cucumber slices. Saute it for a minute, then add the rice and masala powder and mix. Add 21/2 cups of water, salt and pressure cook. After 1 whistle, reduce the heat to low and cook for 7 - 8 minutes. 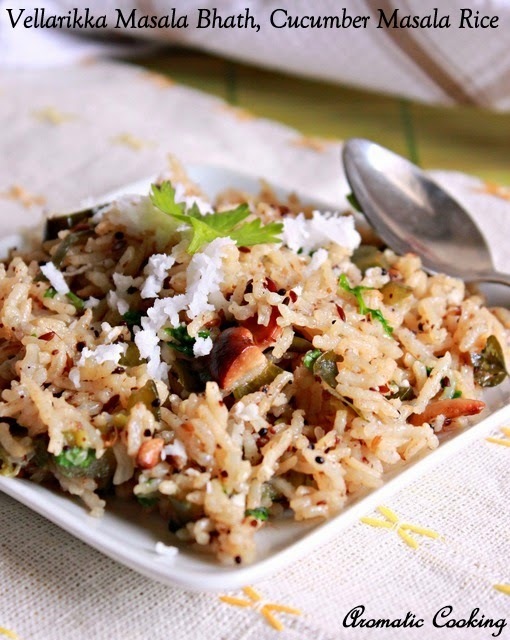 After all the pressure is released, open the pan and mix the coriander and grated coconut and serve it with some raitha. You can do the entire cooking in a regular pot. Make thick slices with the cucumber, not very thin ones and don't peel it. You can add a mixture of ghee and oil for more flavor. oh very diff and yummy rice ...Looks so tempting .. Interesting recipe, looks very tasty.. Simple yet very delicious, Hema. Vellarikka masala bath looks delicious lovely one pot meal. Very different masala bath, cucumber i never cooked with rice, sounds fabulous.